The Rabbit's Hat - "BBC & Related Acoustic Sessions"
Now here's a gem for fans of Tim Jones & Terri~B of the Stone Premonitions label. Those familiar with Census Of Hallucinations, Body Full Of Stars, and of course the full band version of The Rabbit's Hat, will know that this duo are among the music world's criminally undiscovered treasures. Phenomenal songwriters, musicians, and vocalists, Tim & Terri's music blends and crosses over many styles including progressive rock, psychedelia, folk, and pop. BBC & Related Acoustic Sessions is just what the title implies... just Tim & Terri and an acoustic guitar. In earlier reviews I've tried to communicate the sheer beauty and magic of this duo's vocals that together exude more emotion and soul than most of the megastars burning up the radio and video waves these days. Tim & Terri's vocals and poignant lyrics take front and center stage on the 18 unplugged tracks that make up this set. Not surprisingly it's the more folk oriented side of their music that dominates, but as with everything else these talented artists do the music ultimately transcends genres and labels to become something uniquely their own. We'll call it melodic progressive folk rock. And as icing on the cake some of my favorite tracks from the Rabbit's Hat and Census Of Hallucinations library are included: "Ephemeral Fire", "Say Yes", "Lie Again", and the wonderful "The Moon" and "Orion". Highest recommendation to fans of any musical style who have a soft spot in their hearts for a damn good well sung song. 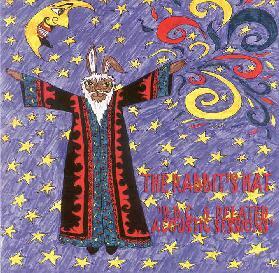 For more information about The Rabbit's Hat and their many releases, you can visit the Stone Premonitions web site at: http://www.aural-innovations.com/stonepremonitions.